A circuit breaker is an automatic electrical switch that protects a circuit from damage when a large current surges through. More simply explained: whenever an electrical circuit has too much current flowing through it, the circuit breaker cuts power before damage occurs. It is an incredibly important mechanism and a necessary safety feature for your home, so read on to learn more. What Does a “Tripped” Circuit Breaker Mean? A “tripped” circuit breaker results when too large of a current attempts to run through the circuit. When the circuit breaks, the power is shut off, after which it has to be turned back on manually. A circuit “tripping” is a safety measure. If it happens often, then it usually indicates an electrical issue that a professional should inspect. An overloaded circuit: This occurs when too many powerful devices are all plugged in on the same circuit. Overloaded circuits can cause permanent damage to your devices. A short circuit: A short circuit occurs when an active or “hot” wire touches either another hot wire or a neutral wire in one of your outlets. This causes a large current flow with more heat than the circuit can handle. A short circuit is a fire hazard and can cause smoke or even sparks if the fuse blows. A ground fault: Similar to a short circuit, a ground fault occurs when a hot wire touches the grounding wire. A ground fault can cause a discoloration around your outlet and may produce a burning smell. Ground faults are considered dangerous and cause the safe grounding of the wire useless. If a circuit trips once, inspect it and move your devices to ensure that they are not the issue. 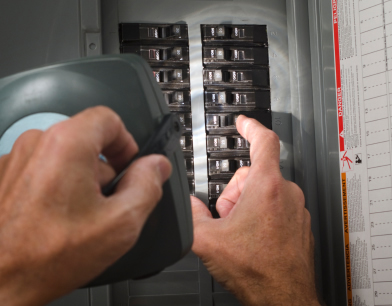 If a circuit breaker trips repeatedly, then consult a professional electrician. Electrical fires account for approximately 10% of all residential fires. Don’t take a chance when it comes safety. Hire an electrician and ensure that all your wiring is safe and working properly. For those looking for residential electrical services in Baltimore County, Tim Kyle Electric is your top choice. At Tim Kyle, customer satisfaction is our top priority.